What is Jeb Bush’s Role in the Lehman Brothers Meltdown? LEHMAN BROTHERS was founded in 1850. The firm managed to get through the Civil War, WWI, and WWII, the Great Depression, and the attacks of September 11, 2001. Yet after hiring Jeb Bush in late August of 2007, the firm suddenly goes belly up in a year. It also should be noted that in 2006, George H. Walker IV was also hired by Lehman Brothers. Now, let’s take a walk down memory lane, shall we? Neil Bush: The brother of the current president, son of the elder Bush, was part of yet another huge financial meltdown. This was known as the Savings and Loan scandal (S&L). In the late ’80s and early ’90s, Bush embarrassed his father, George H.W. Bush, with his shady dealings as a board member of the infamous Silverado Savings and Loan, whose collapse cost taxpayers $1 billion. After graduating from Texas University, Jeb Bush served a short apprenticeship at the Venezuelan branch of Texas Commerce Bank in Caracas before settling in Miami, in 1980, to work on his father’s unsuccessful primary bid against Ronald Reagan. Campaigning for Dad was hardly a paying job. But Jeb was about to learn that being one of George Bush’s sons means never having to circulate a résumé. In the next few years, financial support flowed to Jeb through Miami’s right-wing Cuban community. Republican party politics and a series of business scandals — including Medicaid fraud and shady S&L deals — were inextricably intertwined. A former federal prosecutor told MJ that, when he looked into Jeb’s lucrative business dealings with a now-fugitive Cuban, he considered two possibilities — Jeb was either crooked or stupid. At the time, he concluded Jeb was merely stupid. Like so many of those who would attach themselves to the Bush sons over the years, Padreda brought some hefty luggage with him. In 1982, four years before teaming up with Jeb, Padreda, along with another right-wing Cuban exile, Hernandez Cartaya, was indicted and accused of looting Jefferson Savings and Loan Association in McAllen, Texas. The federal indictment charged that the pair had embezzled over $500,000 from the thrift. (Cartaya was also charged with drug smuggling, money laundering, and gun running.) But the Jefferson Savings case would never go to trial. Recarey also surrounded himself with those who could influence the political system. He hired Jeb Bush as IMC’s “real-estate consultant.” Though Jeb would never close a single real-estate deal, his contract called for him to earn up to $250,000 (he actually received $75,000). Jeb’s real value to Recarey was not in real estate but in his help in facilitating the largest HMO Medicare fraud in U.S. history. Jeb phoned top Health and Human Services officials in Washington in 1985 to lobby for a special exemption from HHS rules for IMC. This highly unusual waiver was critical to Recarey’s scam. Without it, the company would have been limited to a Medicare patient load of 50 percent. The balance of IMC’s patients would have had to be private — that is, paying — customers. Recarey preferred the steady flow of federal Medicare money to the thought of actually running a real HMO. Former HHS chief of staff McClain Haddow (who later became a paid consultant to IMC) testified in 1987 Jeb that directly phoned then-HHS secretary Margaret Heckler and that it was that call that swung the decision to approve IMCs waiver. 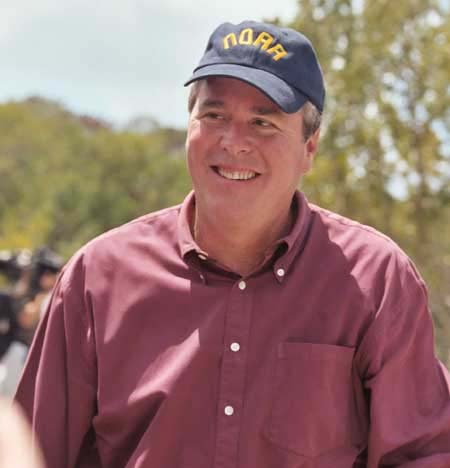 Manuel C. Diaz, another Jeb Bush business associate, runs a commercial nursery with headquarters in Homestead, Florida. Manny Diaz’s previous business sidekick, Charles Keating, Jr., is now sitting in a California prison. But during Keating’s days at the helm of the $6 billion Lincoln Savings, Diaz became a Keating insider, confidant, and beneficiary. For example, in 1987, as federal regulators closed in on his crumbling empire, Keating instructed his attorneys to transfer a large chunk of prime Phoenix real estate to Diaz, for just $1. And right before filing for personal bankruptcy, Keating transferred his $2 million mansion on the island of Cat Cay in the Bahamas to Diaz. At the same time Diaz was palling around with Keating, Jeb, then serving as Florida’s secretary of commerce, arranged a private meeting for Diaz with Florida’s Republican governor Bob Martinez. Promptly afterward, Diaz Farms landed a lucrative, $1.72 million, state-highway-landscaping contract — despite the fact that Diaz had little prior highway-landscaping experience. This raised howls of protest and charges of political influence-peddling from other contractors. But state officials explained that the extraordinary speed in issuing the contract had occurred because the state was anxious to spruce up 113 miles of freeway for the coming visit of the pope. Did Jeb know about Diaz’s business association with Charles Keating? Did he have reason to believe Diaz was qualified for the Florida highway contract that he helped Diaz land? These are the kinds of detailed questions that the Florida chairman of the Bush re-election campaign refuses to answer.